CBS invited a number of media outlets to tour the set where Jericho is currently shooting seven new episodes for a faux second season, a backtrack by the network after it canceled the intriguing drama after the first season suffered a continual ratings decline despite reviews that pointed out an upswing in quality as it neared the season finale. The show was set in Jericho, Kansas, immediately before and after a nuclear weapon was detonated in near-by Denver. 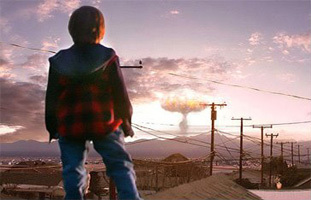 As the first season progressed, viewers learned that a large portion of the United States had been devastated by identical bombs. As the finale neared, Jericho was on the verge of going to war with a neighboring town over resources such as food. What follows are links and quotes from two publications on what they discovered about the plot for this new limited run series. While the first season focused on the inhabitants of Jericho dealing with the loss of an organized federal government and everything it provides that we take for granted, the new run of episodes is said to focus on the introduction of new elements that move in to fill the vacuum left behind, and how Jericho's cast of characters deal with these new problems. Among the new buildings on the freshly rebuilt main street in the Van Nuys suburb of Los Angeles was a cement facade that housed the headquarters of Jennings and Rall, a multinational organization that sets up shop in the town in season two. There was also evidence of a continued military presence following its arrival in the season finale to suppress the hostilities between Jericho and the neighboring town of New Bern. Scifi Wire talks about how the new show will be structured more like a feature film that a conventional television series, because of the limited number of episodes in which to tell their story. CBS President Nina Tassler has said that should Jericho see better ratings the second time around, there exists the possibility for more episodes to be ordered and a full season eventually produced, though without specifics, it is impossible to know if they would be able to immediately continue into the next story arc for the fall of 2007, or if further episodes would follow in 2009. Comingsoon.net confirms that the new episodes will resume where the first season left off, in the middle of a possible military intervention between Jericho and rival town New Bern, but won't linger there for very long. The sheriff's office received a new look for this season; they brought in Esai Morales as new character Col. Hoffman. "Part of the storyline in Season 2 is the military we introduced everybody to in episode 22, now plays a role in Season 2. The Cheyenne military moves in, and shares the office space with the sheriff. Esai has been put in charge, and because this town does not have a sheriff, yet, he takes over." Also hinted at is a new player in Jericho in the form of corporate thug looking to help, and probably exploit, and certainly cause problems for desperate residents. There is a bit more on Comingsoon, and of course the link above for Scifi Wire's set visit. CBS has not announced a date for the return of Jericho, which could come later this fall or sometime next year. With only seven episodes produced, and I've argued this before, Jericho makes an attractive stop-gap for any one of the network's fall shows that choke and find themselves canceled as well.